Found the following in a 1994 "sports look" magazine. I know some is known but still interesting. 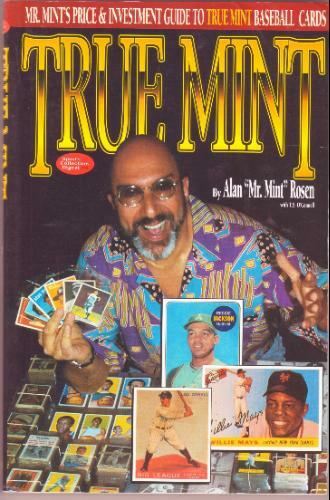 In 1986, Mr mint Alan Rosen got a call from a Boston truck driver who found a half vending case of 52 topps totaling 5513 cards which yielded 4300 mint cards the rest being oc or slightly damaged. The card numbers consisted of 251-407 and were part of a promotion by the Grayco Corp, a kids sporting goods company. For each bat, ball or glove bought, the child got "three shiny new baseball gum cards." Rosen spent 105k and turned it into 250k in two months by selling COMPLETE RUNS of 251 to 407 for $2500 each!!!! At one point, I used to like Mr. Mint. He was the king of vintage finds. Little did we all know, he had to beg-borrow to buy those 1952 topps card. All flash with the gold chains, rings, watch (probably fake) nice suits and always had a fist full of cash. He became really condescending in the early 90's that when he came to Cincy, if you didnt have anything pre-1960, he wasnt talking to you and basically told you that you had nothing but junk. I did sell him some stuff but he acted like he was doing me a favor by selling to him, so thats where I really didnt like him much after that. Is he still in the hobby or in jail? I think he has taken a back seat now and quasi-retired from the hobby. I have not seen him at the last few Nationals I attended and I had heard that he quit doing shows. He was a turd and in my experience he tried to downplay the items I had for sale, telling me they were not worth much so much so that he pursued me as I left his table. I had some nice vintage signed 8x10 photos of some decent hall of famers like Hartnett and Foxx and a long, handwritten letter from Frankie Frisch with all baseball content that he said was a dime a dozen yet he asked me to sell to him because I was not going to get anything else for them. The thing with Alan is he would buy from the walk-ins and take whatever he bought for a song and peddle them to a network of dealers he had at the show for a very quick profit. He rarely took anything home he bought as he knew his network so well. I guess the business model worked as the sellers were happy (although many didnt know any better), he was happy because he usually got items for a very low price and the dealers he sold to were happy because they got items at a wholesale cost from Rosen. As for those items I had to sell him, I walked to one of the dealers he would have sold them to (the dealer admitted to me he was a buy from Rosen of the types of Items I had) and the buyer gave me the wholesale price he would have paid Rosen. Alan Rosen wrote a whole book about his amazing finds. The 1952 Topps find is explained in detail over five pages and is a fascinating read. There are also his personal stories of other incredible finds, like unopened boxes of old Bowmans, all the way up to buying a complete run of Topps sets from the guy who won them in the 1992 Topps 40th Anniversary contest. Half of the book is about his finds, the other half is his investment tips and what he thinks cards are really worth. You can find the book on eBay and other places for a couple of bucks. He used to give those books auto and autograph them before he had bobble heads made of himself to give away. I will admit his finds are very cool....just not a fan of the man himself. Last edited by sportscardtheory; 04-16-2014 at 04:45 PM. tradingcardcommunity on reddit - CLICK HERE, JOIN AND POST! Is that "true mint" book really 300 pages? Is it mostly prices or stories? The first 88 pages are stories and pictures of his finds, experiences and his methods for how he buys and sells for profit. He also has a chapter about the players he's met and card show experiences, and how he quit his job as a copy machine salesman to travel the country to buy cards. He also talks about going out on finds with the infamous Bill Mastro. The rest of the book is his "price guide" of all the major sets from 1900 to 1975, along with his investment advice and what he thinks are the most undervalued and overrated cards from each set. One interesting mention before the 1958 Topps set, is he says he's never found or even seen an unopened 1958 Topps wax box, despite finding hundreds of unopened boxes from other years. Well then sounds like a book I'll have to pick up. Love this type of stuff. I placed an advertisement in Sports Collectors Digest trying to sell the Mantles for $3,500 each, perfectly centered gem mint cards, and I ran photos with the advertisement. I didn't sell any Mantles at that price. I was crushed. So I started blowing them out, and most of them I sold to dealers for $2,000 each. The last ten I sold to John Broggi of JKJ Sports Collectibles. He paid $12,500 for the ten of them. That was 1986, right before the major baseball card boom. He says, six months later, those same Mantles he sold were selling for up to $10,000 each and he wished he could go back in time. Then a few years later, one of the Mantles he sold to Jim Copeland for $2,000 sold for $41,000 at auction. As McHenrycards wrote earlier in this thread, Rosen always made a profit quicky, never wanting to hold on to cards for long, many times selling what he bought the same day. The downside of that, was he did this just before the boom of the late '80s and he could have been incredibly rich if he had just held the cards for a few years. But he had a salesman's attitude: buy low, sell high and make a profit right away. That way he never lost money by holding too long. Last edited by Austin; 04-16-2014 at 05:46 PM. All times are GMT -4. The time now is 09:21 AM. Advanced Censorship provided by Advanced Censor Options v1.0.2 (Lite) - vBulletin Mods & Addons Copyright © 2019 DragonByte Technologies Ltd. Runs best on HiVelocity Hosting.